Fabulous quiet 70 sqm apt. with sunny terrace and hyper-equipped kitchen. It is close to all sights while just away from tourist traps and is located in the most bohemian and lively area at the border of Wenceslas Sq. and Vinohrady with beautiful Art Deco and Art Nouveau buildings, parks and great restaurants. If you are looking for true local experience in great, safe and lively neighborhood, super quick and easy access to all popular sites then this is YOUR place! We will do our utmost for you to be delighted! Bedroom has comfortable Super King size bed (200x180) and quality mattress, second room serves as living room and dining room. Kitchen is divided by column, there is small entry hall with big wardrobe and bathroom. It is ideal for couples, but can easily accommodate 4 people. It is on the 5th and last floor of an old well kept building but "WITH NEW ELEVATOR". It is very sunny and bright, peaceful and absolutely quiet as it faces the rear of the building with backyard. There is south oriented balcony-terrace (11m2) where you can enjoy sun rays during romantic breakfast or dinner. Also ideal for relaxing after a long day of visiting and walking around town. Terrace is equipped with electric controlled sun awning. Living room has a dining table for four and comfortable pull out sofa bed where additional two can sleep. There is Samsung smart TV with internet access and NETFLIX subscription, Sony hifi system into which you can connect your iPhone, MP3 player or USB. The kitchen is FULLY equipped with highest line Siemens and AEG appliances - refrigerator, freezer, dishwasher, gas stove with five hobbs, multifunction oven and built in espresso maker for coffee lovers like us. There is also toaster, kettle, full set of utensils, glasses, knifes, pots, pans and rags. Fresh coffee beans, tea, salt, pepper, sugar, dishwasher tablets and more are provided. The bathroom is combined with toilet and also has washing machine. There is large tub with hand shower and will fit 2 medium adults for romantic bath together. Hair dryer, soap, shower gel, shampoo, towels, toilet paper, detergents - will all be ready for you. The floor in the living room is hardwood from tropical IPE wood and in the bedroom is lighter Tauari wood. There are tiles in the hall and bathroom. WIFI internet is fast, unlimited and for your use only. Apartment has independent central heating system with thermostat controlled temperature. There is also small iron and ironing board if needed. We are welcoming our guests personally and providing them with cool maps, our own curated guide and tips to avoid tourists traps and enjoy Prague from the local perspective. We are available to our guests and ready to answer any questions and help 24/7 via sms, phone, messaging apps and email. Apartment is just behind the National Museum on Wenceslas Square and steps from Riegrovy sady (park with amazing views on Prague castle and summer outdoor pubs). This is the most popular central Prague residential area with lots of cafes, restaurants, clubs, shops but also parks while just step away from the tourist crowds and traps. All the main tourist attractions (Charles Bridge, National Theatre, Wenceslas Square, Old Town Square, Prague Castle, Lesser Town Square etc.) are in a walking distance. Main train station (Hlavní nádraží) is less than 15 minutes walk from the apartment and airport is less than 1 hour by public transport (30 mins by taxi or we can arrange our driver for very reasonable price). Walking to Wenceslas square takes about 4 minutes then 10 minutes to Oldtown square and Charles bridge is another 10 minutes away. However, if you decide to use public transport then closest tram stop is just 100 metres from your door steps and most important transfer metro station "Muzeum" (line A and C) is just 400 metres from the apartment. Line A will take only 3 stops to Malostranska (4 minutes) to reach the bottom of the Prague castle. PARKING garage is 200 meters from the apartment. From 7 EUR/day, reservation required. The earlier you book, the cheaper you park. Hi there! We are Robert and Pavel and we will be happy to host you in Prague and believe you will have a great and memorable stay! We aim you to experience ease, comfort and safety. We will be meeting you upon your arrival to explain you everything you need to know about Prague, neighbourhood and the apartment you so you can enjoy the Prague from the local perspective. We want you to get acquainted with the best of Prague with the help of our personal guide and maps that we provide you with. We are here offering our help and will answer quickly any questions and will aim to make sure you have a fabulous time. A little bit about us - Robert was born in Prague and lived here most of his life while Pavel was born in Pilsen (where Pilsner beer was born) and moved to Prague for his studies long time ago while it quickly became his hometown too. We love to travel and experience the countries or cities we travel to from the local perspective. We love to eat good food, drink good beer, wine and sometimes we even plan our vacations with that in mind :) A hop-on, hop-off bus? A boat cruise along the sites? That is really not our cup of tea. But discovering city from the inside, enjoying cool hipster places with crafted beers? That is what we love. If you are a bit like us than you will definitely have a great time in our apartments! We made our apartment with our guests in mind to have a HOME AWAY FROM HOME. We believe it's a delightful retreat after a day enjoying the "center” touristic buzz that is just steps away. We look forward welcoming you in Prague! We consider Vinohrady to be the best area to stay and live in Prague. It is heaven for lovers of Art Nouveau and Art Deco architecture and neighborhood restaurants. The name Vinohrady refers to the vineyards that thrived here in the fourteenth century. Apartment is build in 2010 in the attic of the residential building from early 20th century. It is about 70 sqm and is completely refurnished. It can easily accommodate 4 people. It is modern and fully equipped with everything you need for either short or long stay for pleasure or business. My husband and I stayed here for 5 nights while touring Prague. It is an ideal place to stay, just a few steps away from the hustle and bustle of Wenceslas Square, but close enough to everything. Our hosts Rob and Pavel are the most responsive hosts ever! It seems they can always be reached by email within a short time (even with the time-zone differences). They also arranged our airport pickup, which was such a relief after a long transatlantic flight. The apartment was clean, comfortable, and stylishly furnished. It is on the 5th floor, but there is an elevator. We benefited greatly from Rob and Pavel's guide and tips to the city (do read it!). By the way, the restaurant just around the corner Hospoda Hajnovka is very good. I would highly recommend this place for a couple who like to take it easy and stay in a quieter neighborhood and still enjoy everything Prague has to offer. What an apartment! Everything you could want & need. Robert and Pavels apartment was a real treat. Well maintained, comes with everything you will need for a trip to Prague. The location was perfect proximity to all the city has to offer! Thanks again guys and also to Lukas! 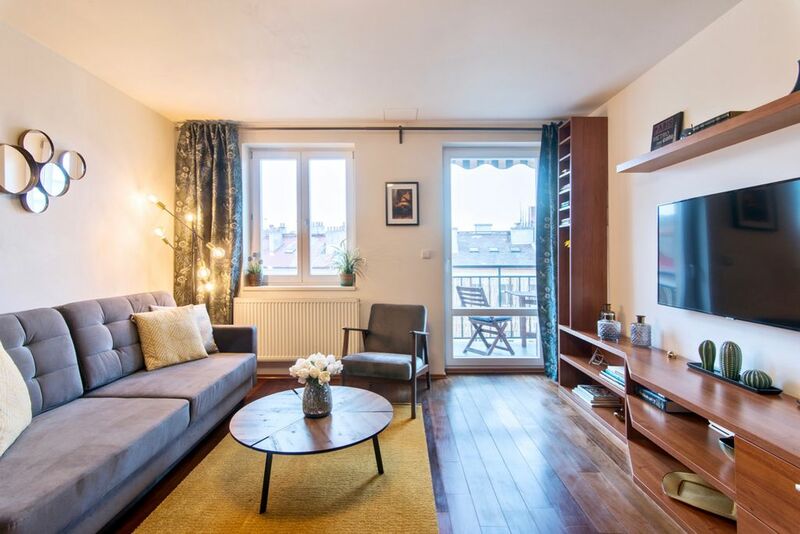 This apartment has a great location - a short walk to Wenceslas Square, but in a quiet residential neighborhood with a wonderful coffee shop nearby. It was well-appointed and impeccably clean. Wi-fi was fast. Rob was very responsive to our queries, and he arranged for a driver to take us to the airport. Overall exactly the experience you want to have in Prague. This apartment has everything you need. It is contemporary, clean and well equipped. It is incredibly convenient and well located. But know that even with the elevator there are several steps to climb. Perfect flat! Excellent location, quiet, spacious, well-furnished and immaculately clean. A first-rate apartment. Pavel and Robert are wonderful hosts: extremely prompt in responding to questions and very helpful. The kitchen is well-designed and equipped. The neighborhood is charming and easy to access by tube (Muzeum station) and tram. It is an easy walk to Prague’s main train station. Vinohrady has many good restaurants, shops and grocery stores. We highly recommend Pavel and Robert’s flat! Perfect - - - beginning to end! From the pre-arrival communications with Pavel & Robert; arrangement for airport transfer; meeting us at the apartment; the apartment itself (beautiful, well appointed, spotless); and the location, nothing could beat this rental. Always quick to respond to a text or email, Robert & Pavel we’re perfect hosts. Highly recommend! !